HMLA-367 spends approximately six of each eighteen months split into rotations to Marine Corps Air Station Futenma, Okinawa, Japan as well as attached as Det "A" in Subic Bay, Philippines, and as part of an Aviation Combat Element (ACE) aboard an amphibious assault ship, typically the USS Tarawa (LHA-1) while in rotation with two other squadrons also based at Marine Corps Air Station Camp Pendleton, California. While not on their rotation overseas, HMLA-367 supported major exercises deploying for training frequently to the Marine Corps Air Ground Combat Center Twentynine Palms, California, Marine Corps Air Station Yuma, Arizona, Nellis Air Force Base, Nevada & Naval Air Station Fallon, Nevada. 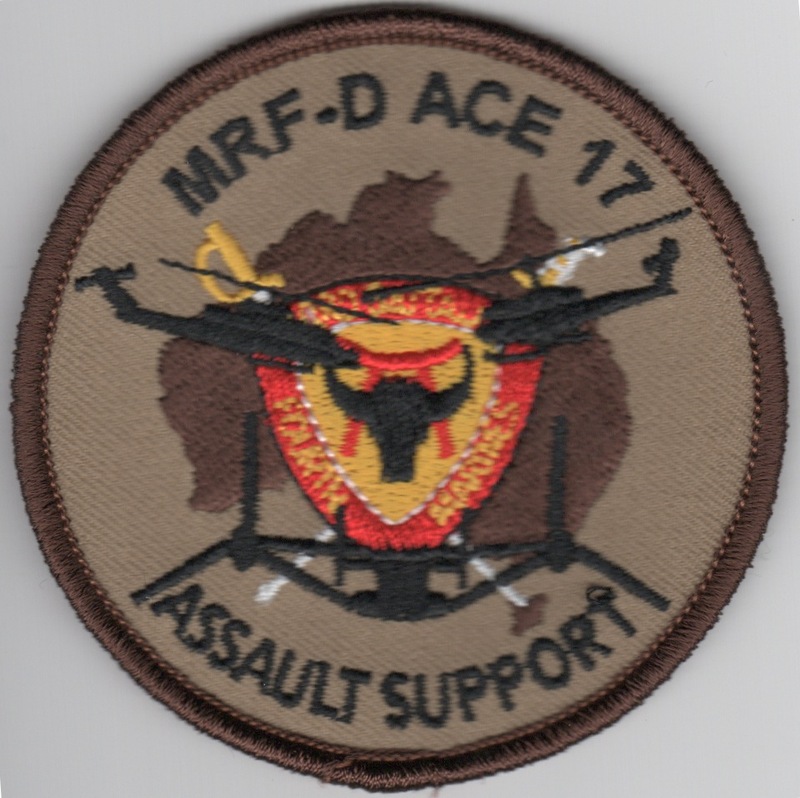 This patch was created for HMLA-367 for one of their deployments/rotations down to Australia and says "MRF-DARWIN". This version has the subdued blue flag on it and does not come with velcro attached. HMLA-367 spends approximately six of each eighteen months split into rotations to Marine Corps Air Station Futenma, Okinawa, Japan as well as attached as Det "A" in Subic Bay, Philippines, and as part of an Aviation Combat Element (ACE) aboard an amphibious assault ship, typically the USS Tarawa (LHA-1) while in rotation with two other squadrons also based at Marine Corps Air Station Camp Pendleton, California. While not on their rotation overseas, HMLA-367 supported major exercises deploying for training frequently to the Marine Corps Air Ground Combat Center Twentynine Palms, California, Marine Corps Air Station Yuma, Arizona, Nellis Air Force Base, Nevada & Naval Air Station Fallon, Nevada. 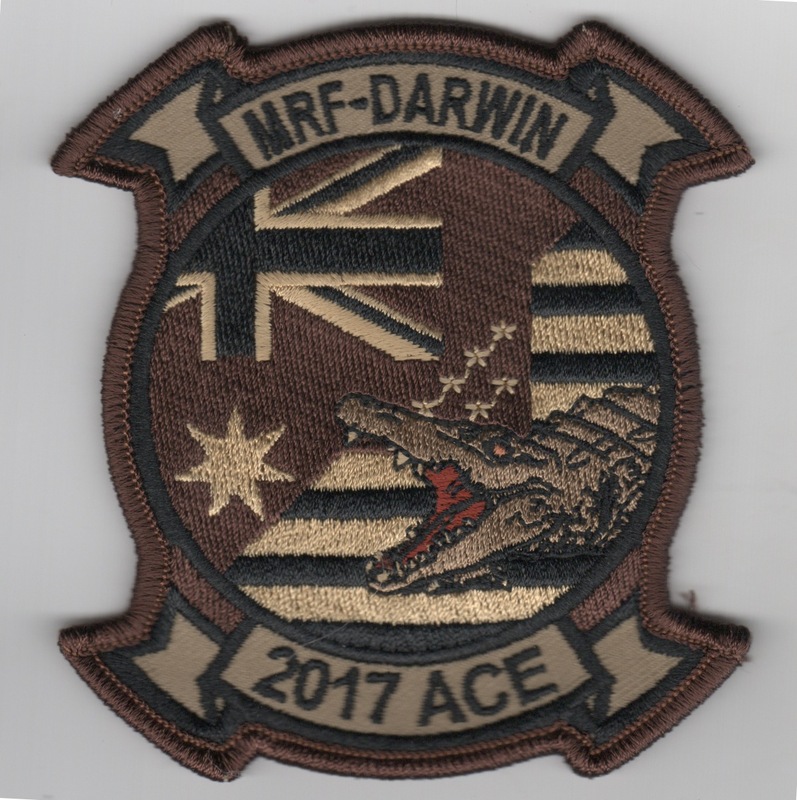 This patch was created for HMLA-367 for one of their deployments/rotations down to Australia and says "MRF-DARWIN". This version has the desert flag on it and does not come with velcro attached. HMLA-367 spends approximately six of each eighteen months split into rotations to Marine Corps Air Station Futenma, Okinawa, Japan as well as attached as Det "A" in Subic Bay, Philippines, and as part of an Aviation Combat Element (ACE) aboard an amphibious assault ship, typically the USS Tarawa (LHA-1) while in rotation with two other squadrons also based at Marine Corps Air Station Camp Pendleton, California. While not on their rotation overseas, HMLA-367 supported major exercises deploying for training frequently to the Marine Corps Air Ground Combat Center Twentynine Palms, California, Marine Corps Air Station Yuma, Arizona, Nellis Air Force Base, Nevada & Naval Air Station Fallon, Nevada. 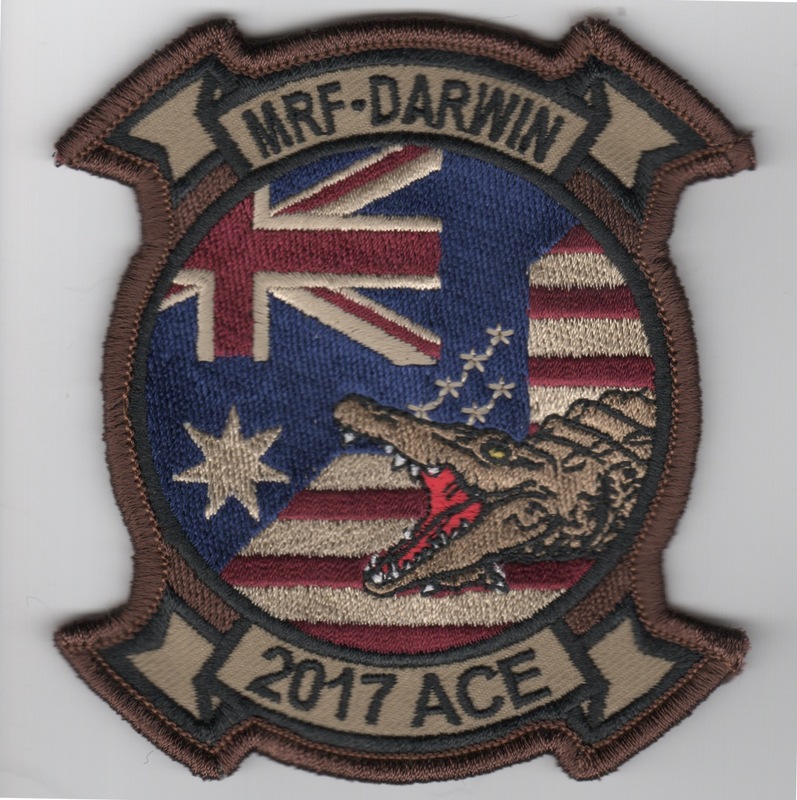 This patch was created for HMLA-367 for one of their deployments/rotations down to Australia and says "MRF-DARWIN". This is the desert version that says "ASSAULT SUPPORT" along the bottom and does not come with velcro attached. 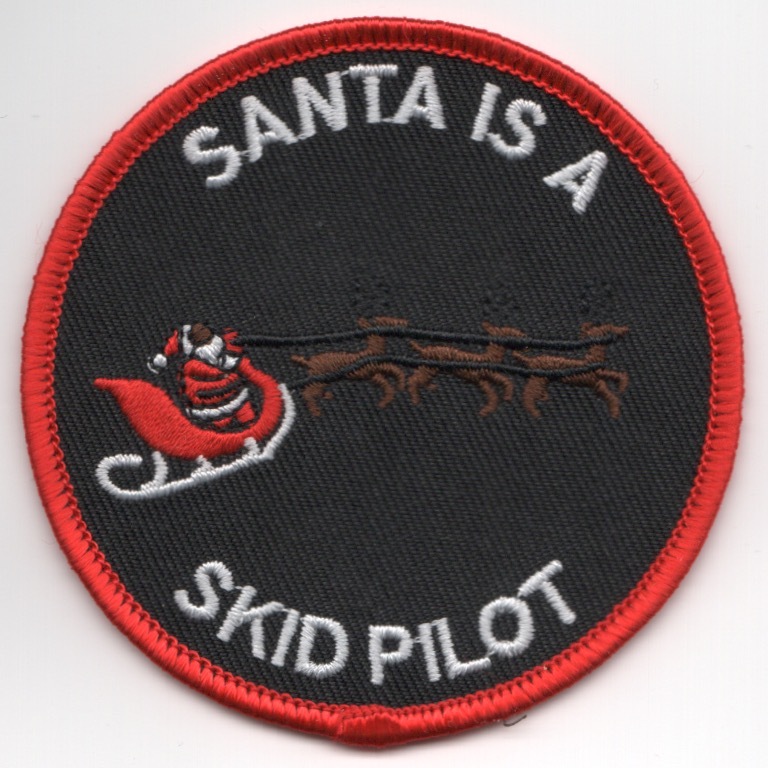 This patch says "SANTA IS A SKID PILOT" and shows his sleigh being pulled by the Reindeer team....This patch does not come with velcro attached. 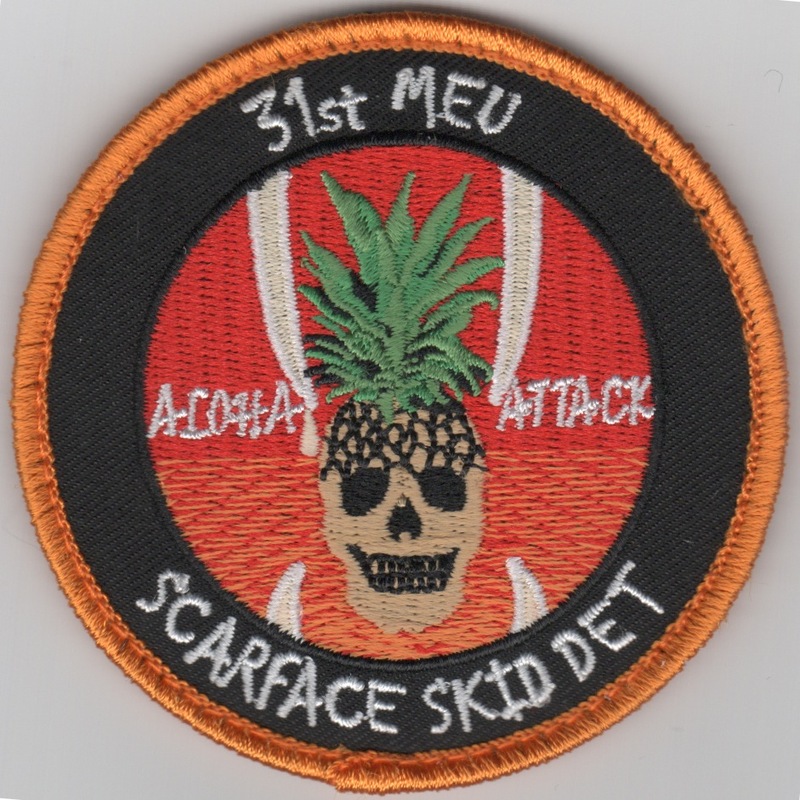 This patch says "31st MEU" (top), "ALOHA ATTACK" (middle) and "SCARFACE SKID DET" (bottom). This patch does come with velcro attached. 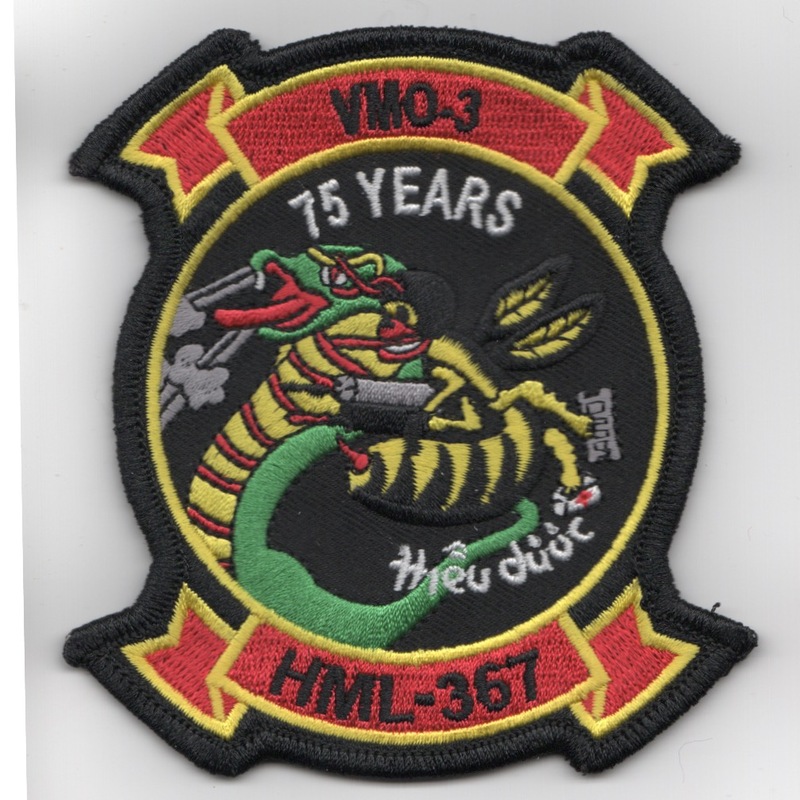 This is the 75th Anniversary patch for HML(a)-367. It says "VMO-3" across the top (unsure why) and does not have velcro attached. See the squadron details above for further information on them. 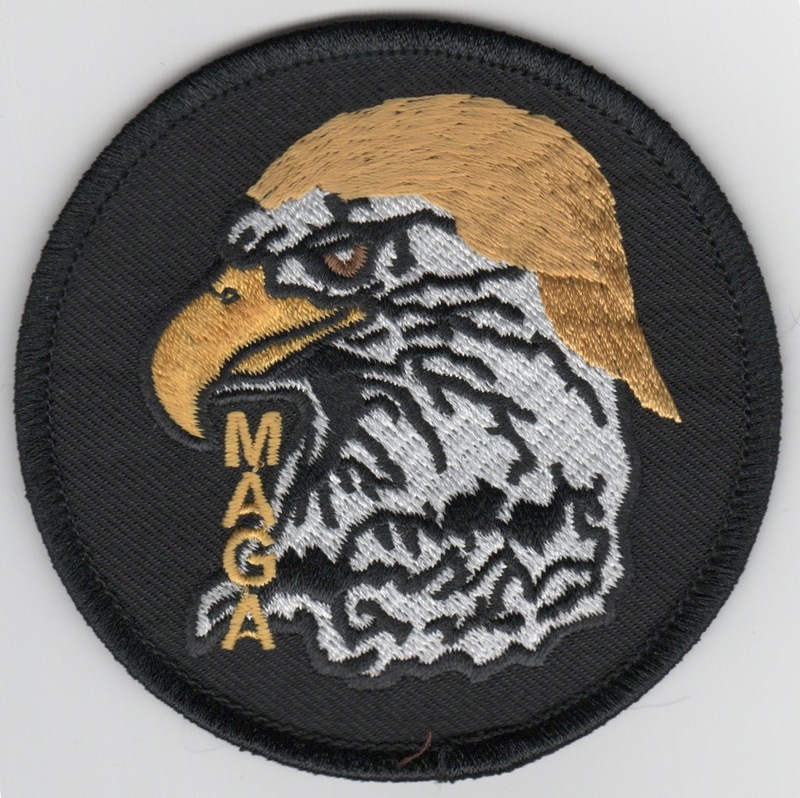 This is the squadron 'spoof' on the USMC WTI patch that shows the WTI Eagle with "Trump Hair" and has the letters 'MAGA' along the eagle. This patch does not come with velcro attached. 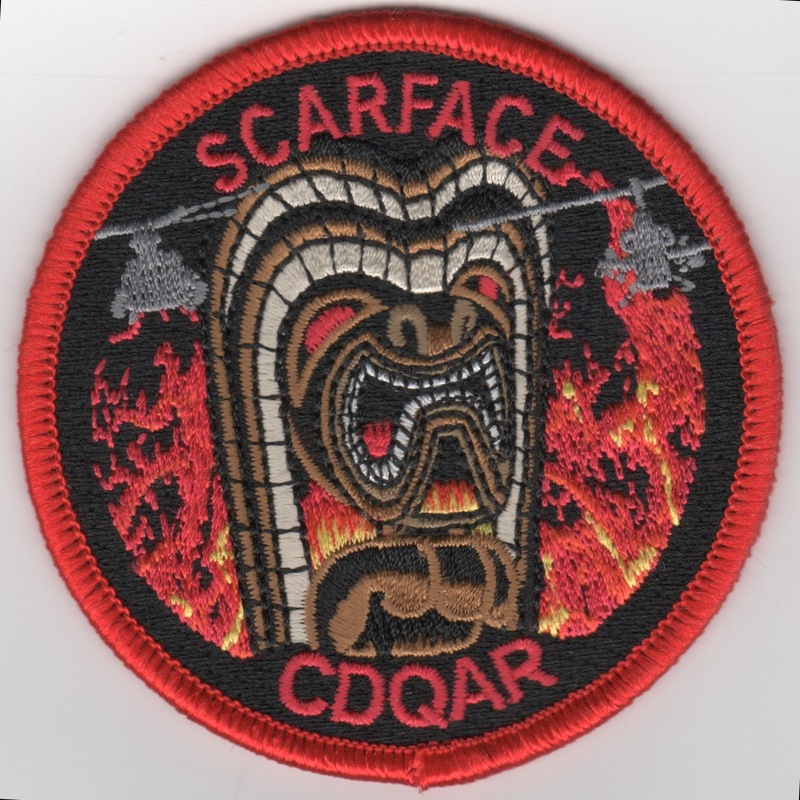 This patch says "Scarface" along the top and "CDQAR" along the bottom with the "Cobra" face in the middle of the patch. It does not come with velcro already attached. 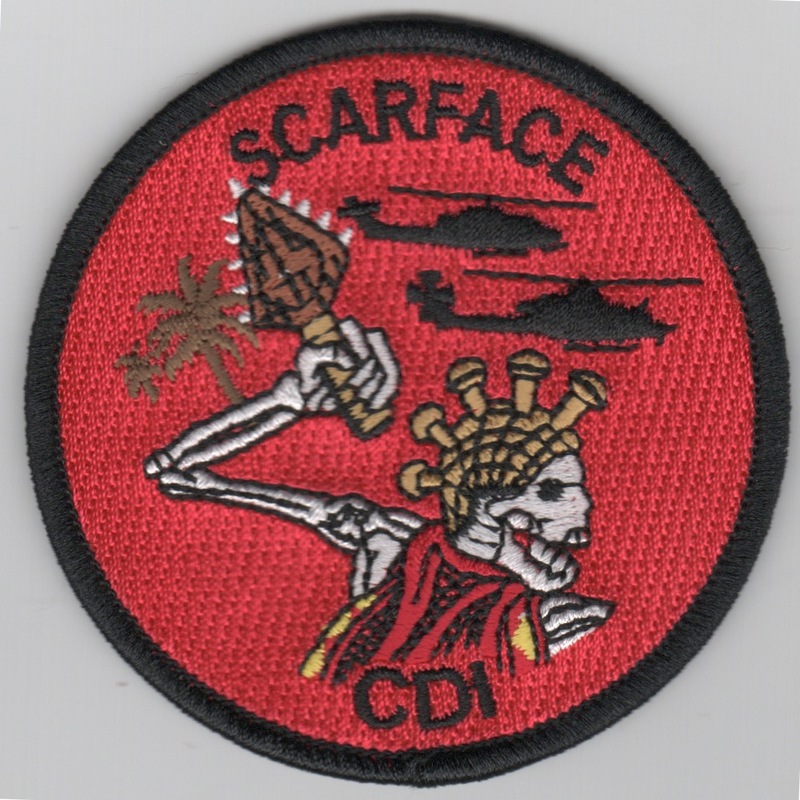 This patch says "Scarface" along the top and "CDI" along the bottom with the "skeleton" in the middle of the patch, along with some rather insidious designs with meanings I don't know of at this time. It does not come with velcro already attached. 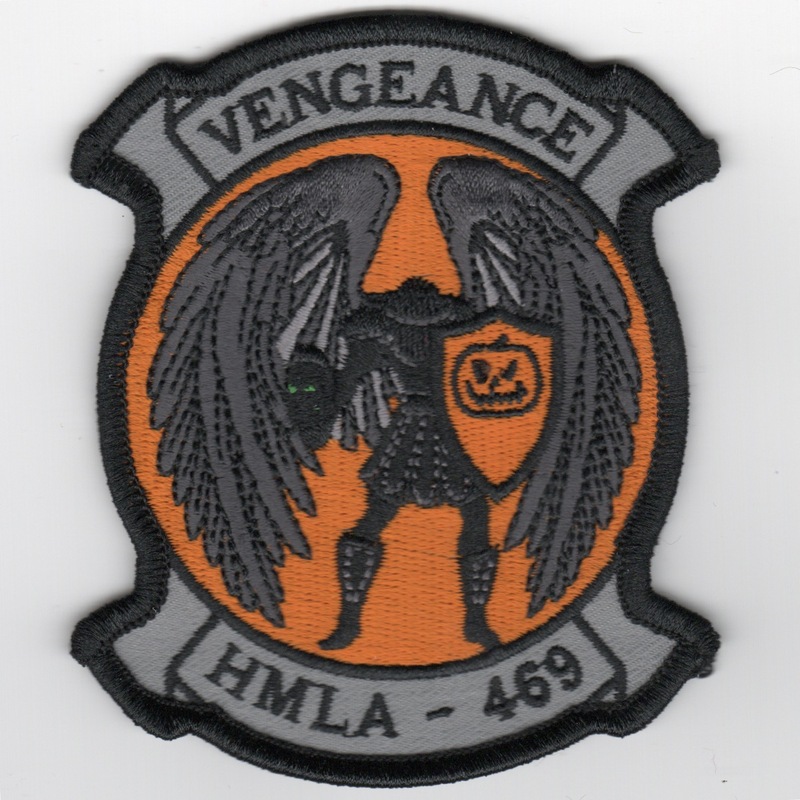 This is the orange version of the squadron patch for HMLA-369. They are attached to MAG-39, located at MCAS Camp Pendleton and were activated 1 Apr 72 as HMA-369. They were then redesignated HMLA-369, 15 Sept 87. They are a highly decorated unit from Vietnam to present with involvement in Southeast Asia Evac, April 1975 to Desert Shield/Desert Storm to Operation Restore Hope - Somalia. This patch already has the velcro on the back. 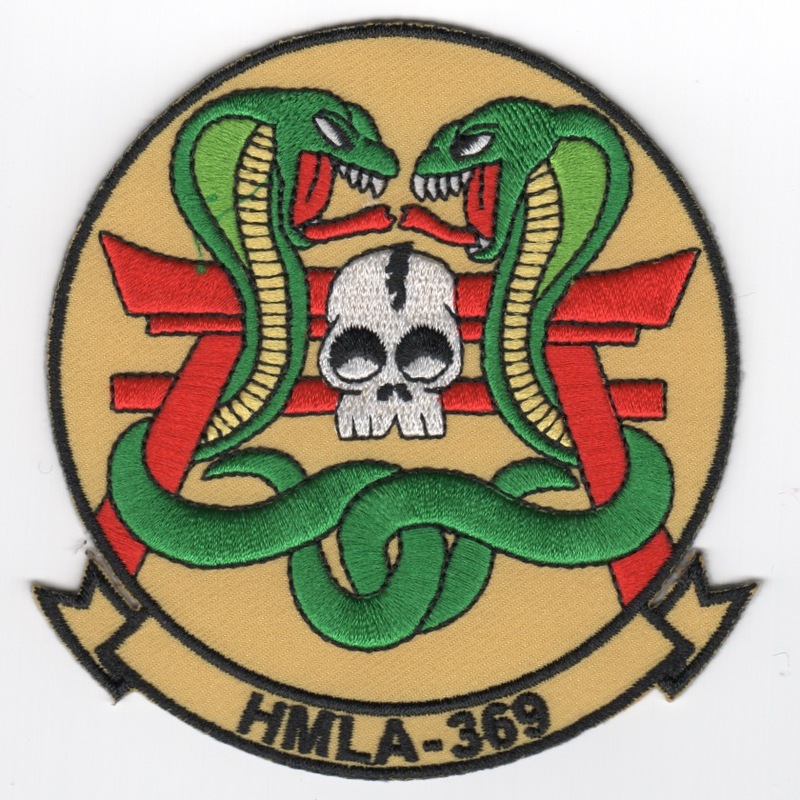 This is the yellow version of the squadron patch for HMLA-369. They are attached to MAG-39, located at MCAS Camp Pendleton and were activated 1 Apr 72 as HMA-369. They were then redesignated HMLA-369, 15 Sept 87. They are a highly decorated unit from Vietnam to present with involvement in Southeast Asia Evac, April 1975 to Desert Shield/Desert Storm to Operation Restore Hope - Somalia. This patch does not have velcro on the back. 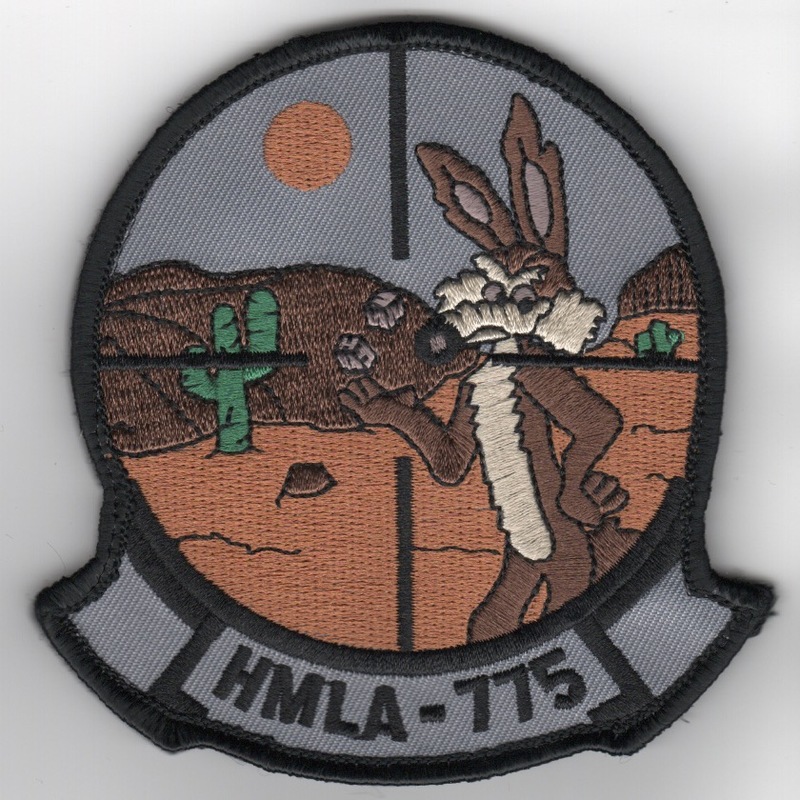 This is the subdued version of the squadron patch for HMLA-369. They are attached to MAG-39, located at MCAS Camp Pendleton and were activated 1 Apr 72 as HMA-369. They were then redesignated HMLA-369, 15 Sept 87. They are a highly decorated unit from Vietnam to present with involvement in Southeast Asia Evac, April 1975 to Desert Shield/Desert Storm to Operation Restore Hope - Somalia. This patch already has the velcro on the back. 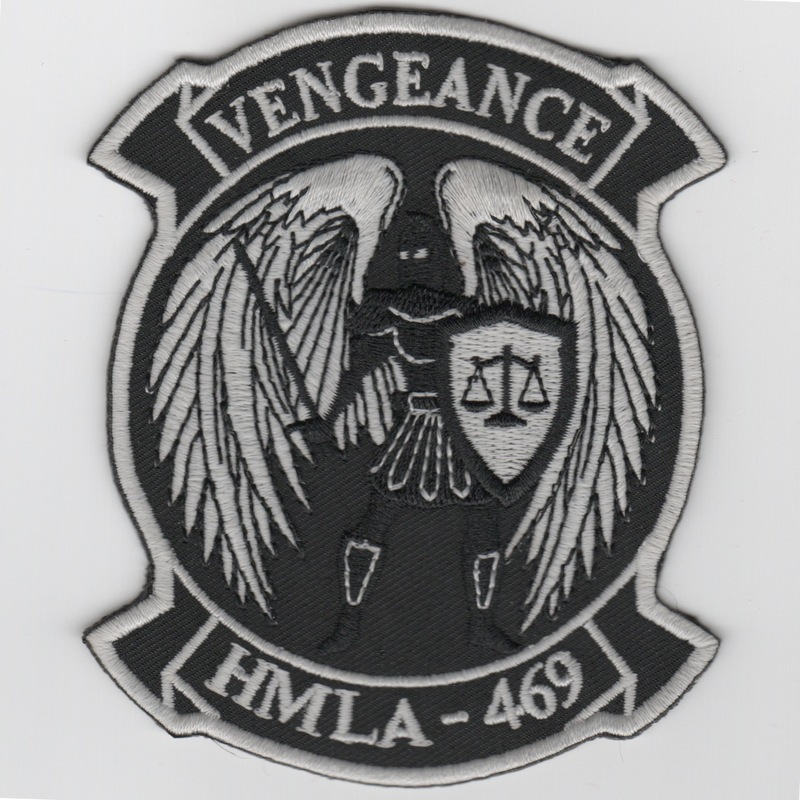 This is the gray version of the squadron patch for HMLA-369. They are attached to MAG-39, located at MCAS Camp Pendleton and were activated 1 Apr 72 as HMA-369. They were then redesignated HMLA-369, 15 Sept 87. They are a highly decorated unit from Vietnam to present with involvement in Southeast Asia Evac, April 1975 to Desert Shield/Desert Storm to Operation Restore Hope - Somalia. 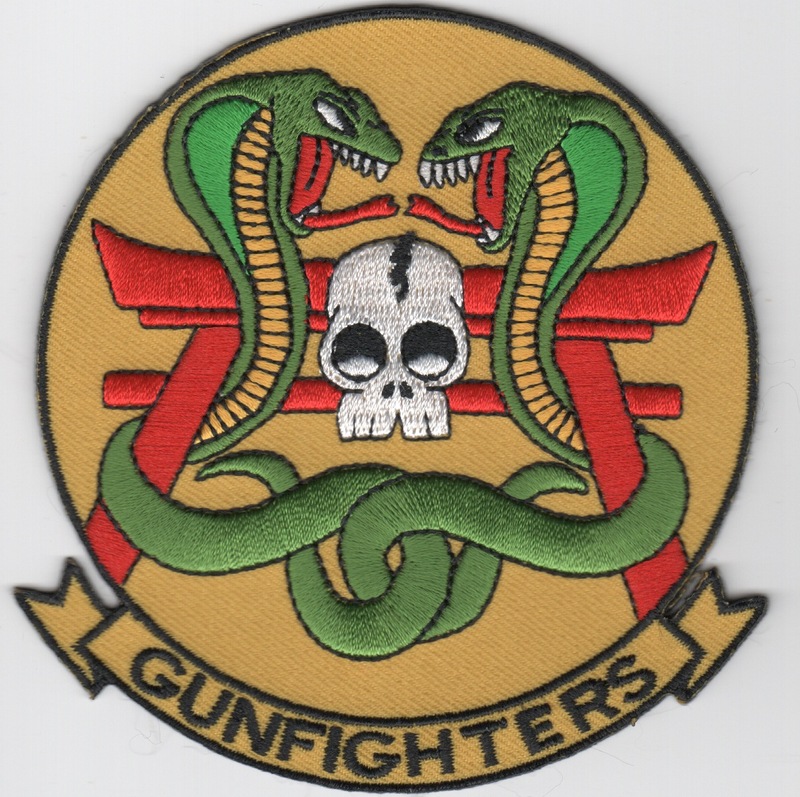 This is the yellow version of the squadron patch for HMLA-369 that says "GUNFIGHTERS" along the bottom. This patch does not have velcro on the back. 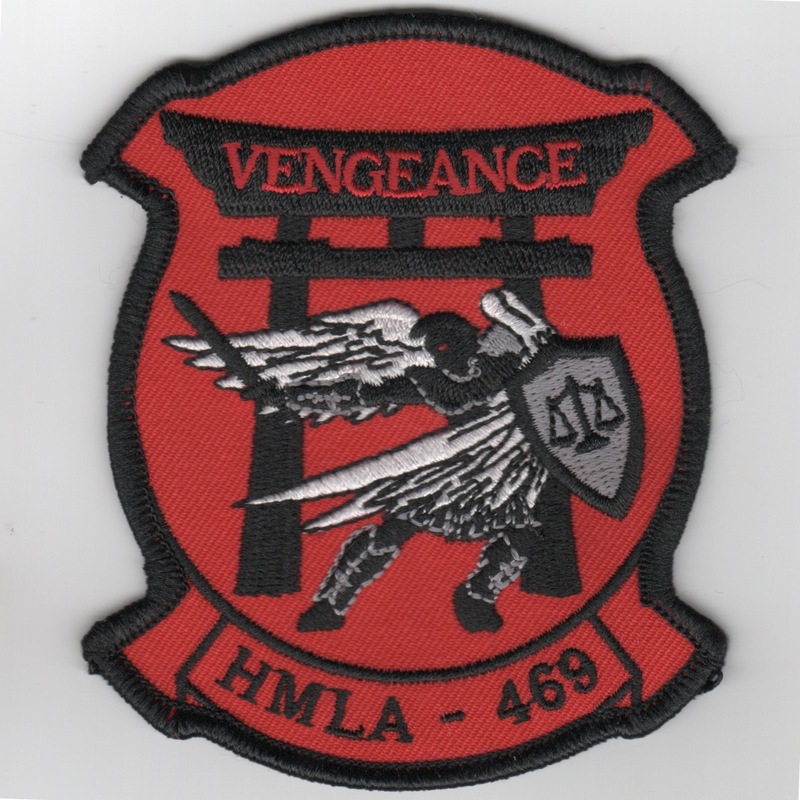 (Korean): Found in a small Korean embroidery shop in limited numbers, this is the historical red-white 'sun-rays' version of the 'VENGEANCE' patch for their Japan Deployment years ago when they were "HMA" instead of "HMLA". It shows a Samurai with wings, the (looks like) Apache Helicopter on a "setting sun" background. This patch has the "in-theater-made" feel to it and does not come with velcro attached. 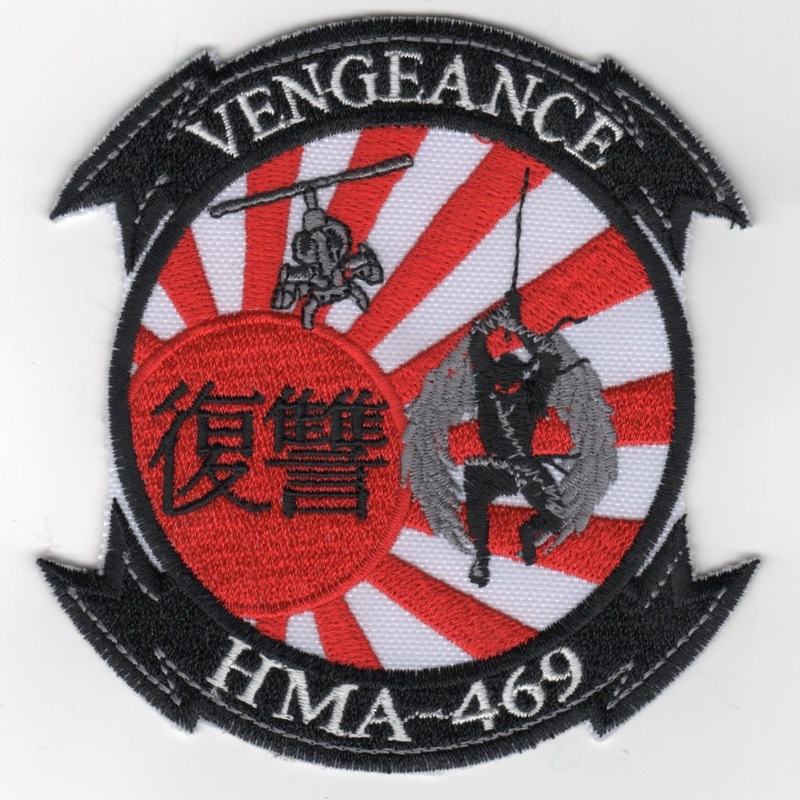 This is the red version of the 'VENGEANCE' patch for their Japan Deployment. It shows a Samurai in full regalia with Japanese script. 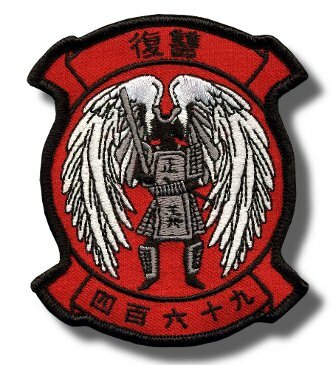 This is the black version of the 'VENGEANCE' patch for their Japan Deployment. It shows a Samurai in full regalia with Japanese script. 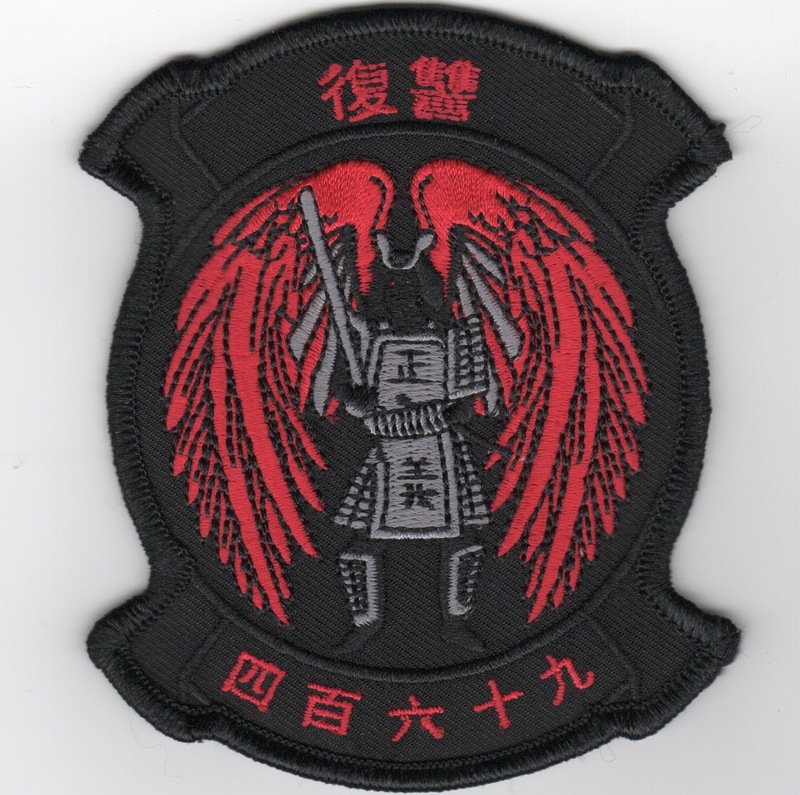 This is the red version of the 'VENGEANCE' patch for their Japan Deployment. It shows a Samurai with white wings, gray shield and the letters in the top of the gateway. This is the red/white/blue version of the 'VENGEANCE' patch for their Japan Deployment. It shows a Samurai with white wings, r/w/b shield on a r/w/b background and the letters in the top of the gateway. This is the black version of the 'VENGEANCE' patch for their Japan Deployment, but this has "GLOW-IN-THE-DARK" threading!! It shows a Samurai with white wings, white shield on a black background and does not come with velcro attached.. 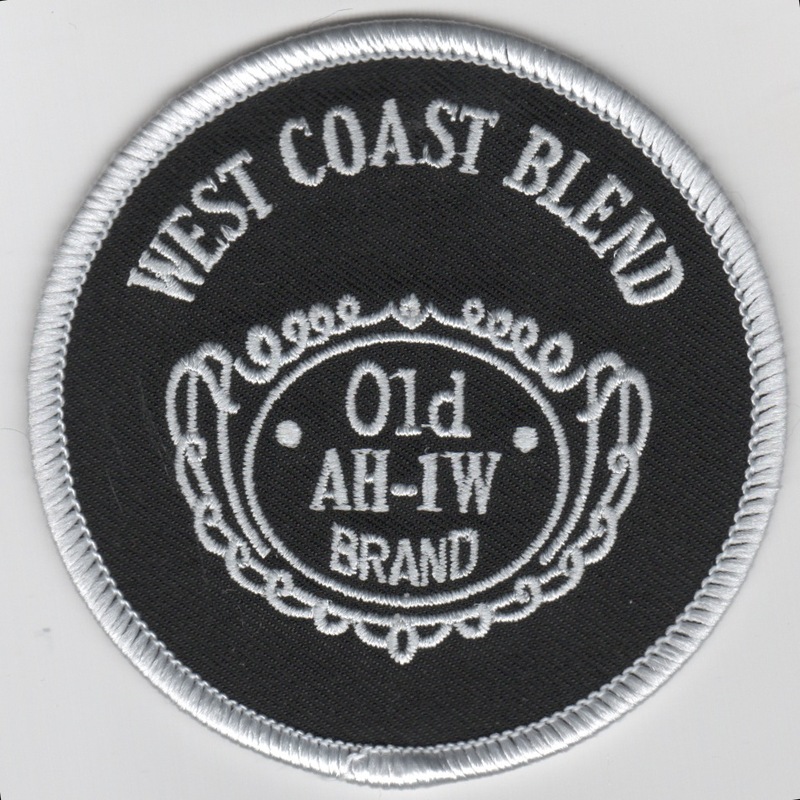 This patch was created by HMLA-469 and says "West Coast Blend" along the top, with "Old AH-1W Brand" in the middle, simulating the Jack Daniels logo. This patch doesn't have velcro and you don't get any licquor with it!! 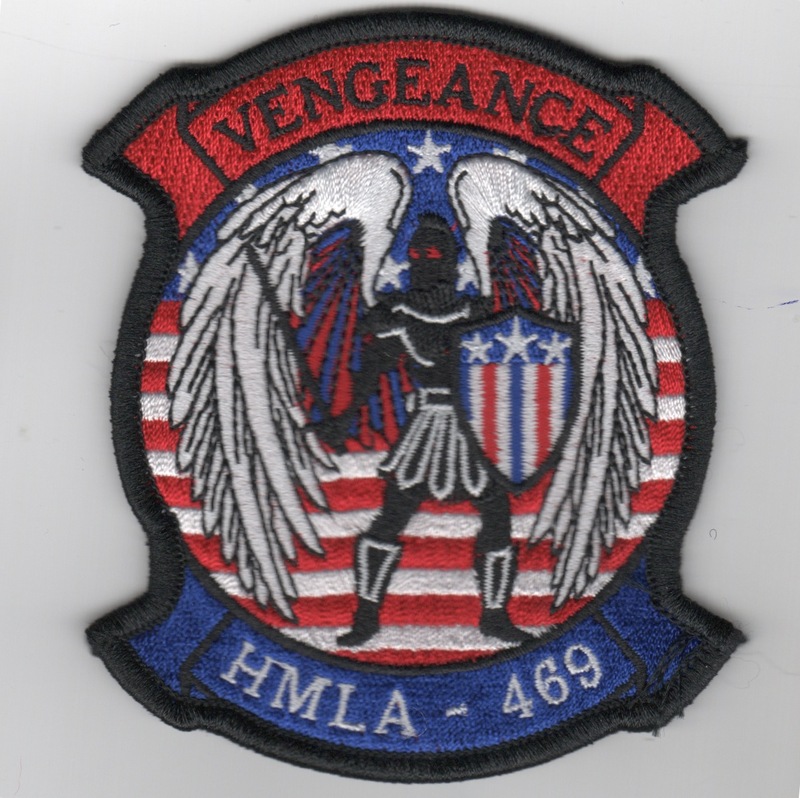 This patch was created by HMLA-469 and says "VENGEANCE" along the top, with an orange background and pumpkin in the middle. This patch doesn't have velcro attached!! 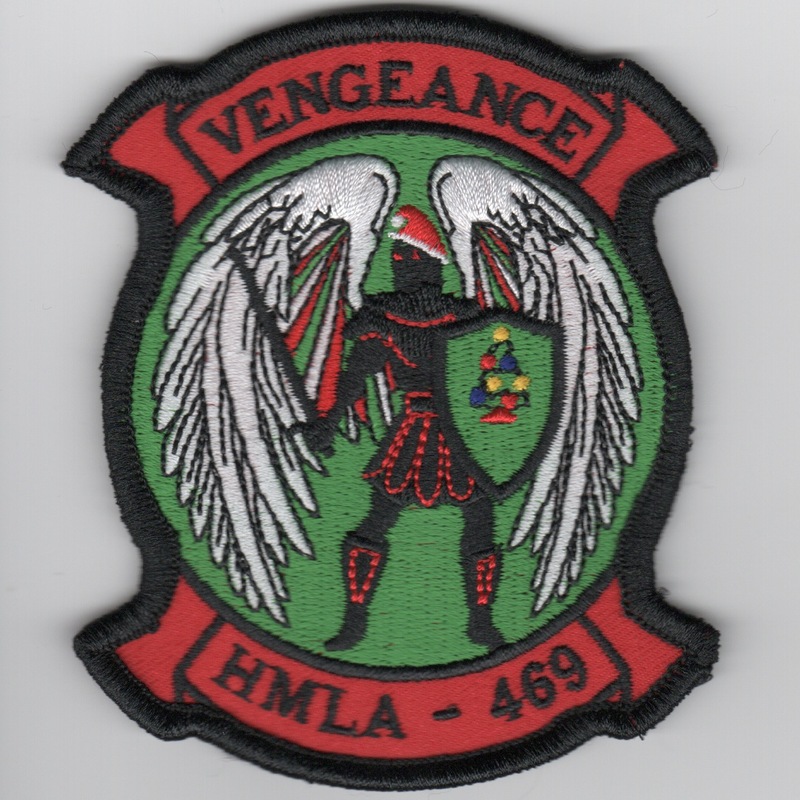 This patch was created by HMLA-469 and says "VENGEANCE" along the top, with a red background and Christmas tree in the middle. This patch doesn't have velcro attached!! 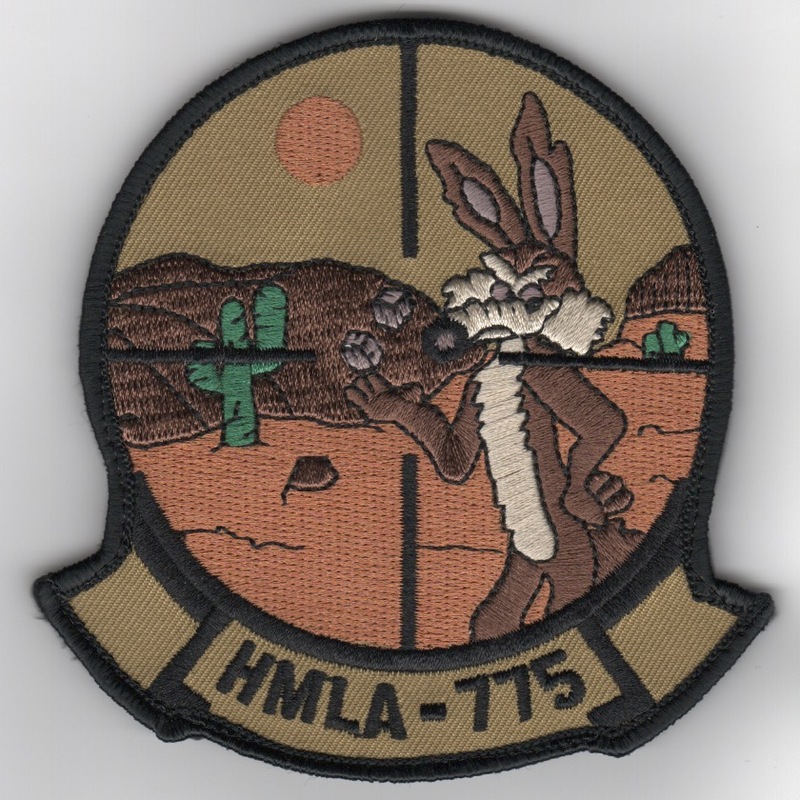 This is the HMLA-469/13 MEU detachment patch created for their deployment. It states "LUCKY ATTACK" along the bottom (sorry, don't know what that means) and depicts "crossed swords" above a deer. This patch doesn't have velcro attached. 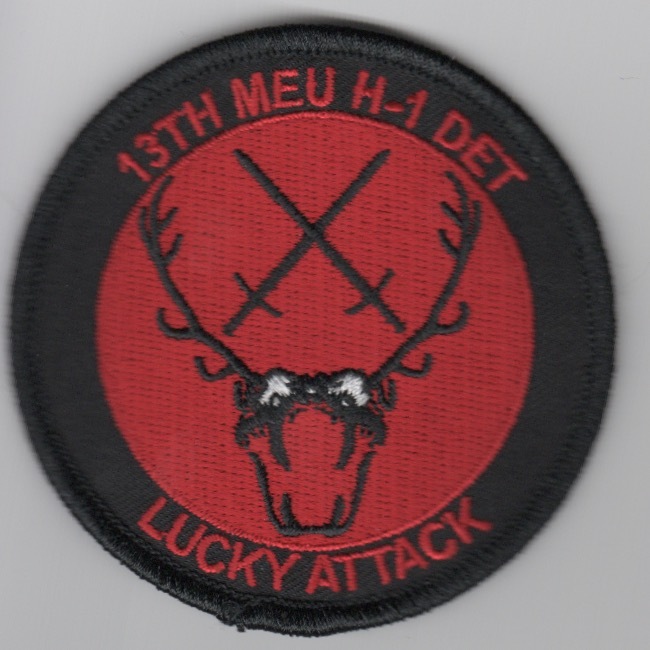 This is the HMLA-469/31 MEU detachment patch created for their deployment. 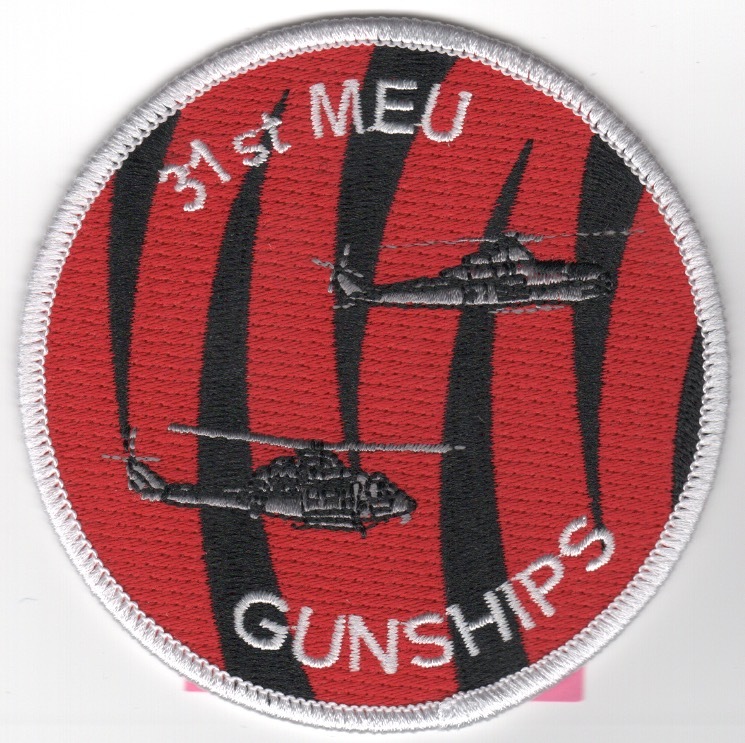 It states "GUNSHIPS" along the bottom and has the Apache and Cobra attack helicopters on a red/black tigerstripe background. This patch doesn't have velcro attached. 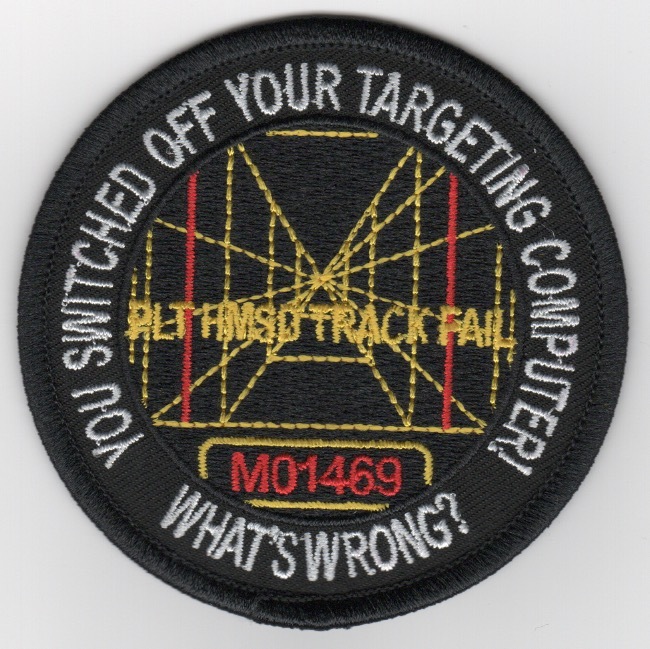 This is the HMLA-469 'Bullet' patch created when they started having issues with their targeting computer. It states "YOU SWITCHED OFF YOUR TARGETING COMPUTER....WHAT'S WRONG?" which is one of the famous lines from Star Wars: A New Hope when Luke attacked the Death Star. This patch doesn't have velcro attached. HMLA-773 Det A 'Red Dogs'BR> Size: 4"
Marine Light Attack Helicopter Squadron 773 (HMLA-773) is a United States Marine Corps helicopter squadron consisting of AH-1W SuperCobra attack helicopters and UH-1Y Huey utility helicopters. The squadron is based at Joint Base McGuire� Dix�Lakehurst, NJ and falls under the command of Marine Aircraft Group 49 (MAG-49) and the 4th Marine Aircraft Wing (4th MAW). Due to re-organization within Marine aviation, the squadron relocated to Joint Base MDL on July 1, 2016. This patch does not come with velcro attached. Marine Light Attack Helicopter Squadron 775 (HMLA-775) is a reserve United States Marine Corps helicopter squadron consisting of AH-1W SuperCobra attack helicopters and UH-1Y Venom utility helicopters. The squadron was reactivated from cadre status on 1 Oct 2016 and is based at Marine Corps Base Camp Pendleton, California and falls under the command of Marine Aircraft Group 41 (MAG-41) and the 4th Marine Aircraft Wing (4th MAW). 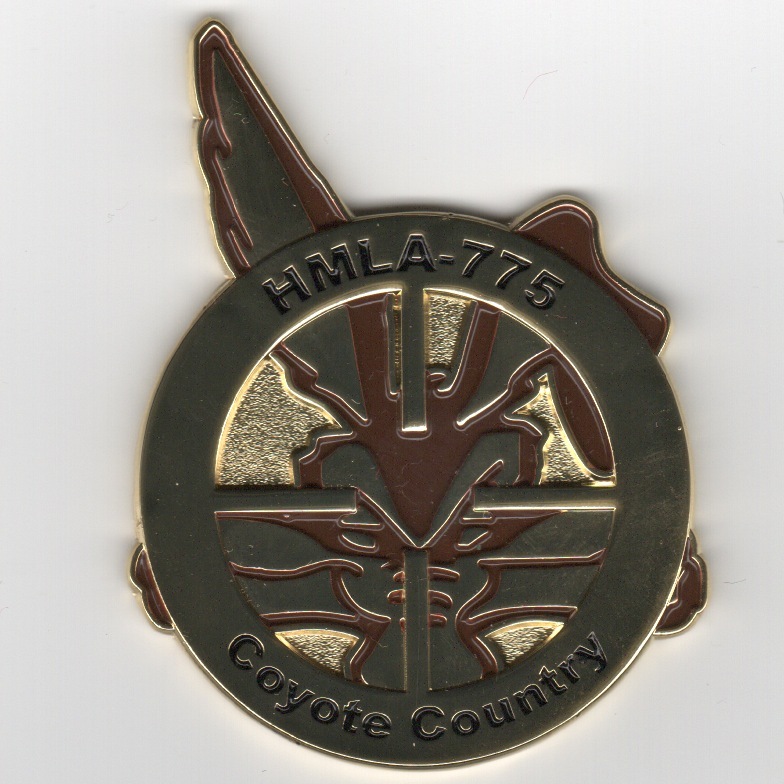 The 'Coyotes' of HMLA-775 participated in Desert Storm operating out of King Abdul Aziz air base, Saudi Arabia. This patch is the 'BLUE SKY' version of the squadron patch and already has the velcro on the back. Marine Light Attack Helicopter Squadron 775 (HMLA-775) is a reserve United States Marine Corps helicopter squadron consisting of AH-1W SuperCobra attack helicopters and UH-1Y Venom utility helicopters. The squadron was reactivated from cadre status on 1 Oct 2016 and is based at Marine Corps Base Camp Pendleton, California and falls under the command of Marine Aircraft Group 41 (MAG-41) and the 4th Marine Aircraft Wing (4th MAW). The 'Coyotes' of HMLA-775 participated in Desert Storm operating out of King Abdul Aziz air base, Saudi Arabia. This patch is the "GRAY SKY" version of the squadron patch and already has the velcro on the back. Marine Light Attack Helicopter Squadron 775 (HMLA-775) is a reserve United States Marine Corps helicopter squadron consisting of AH-1W SuperCobra attack helicopters and UH-1Y Venom utility helicopters. The squadron was reactivated from cadre status on 1 Oct 2016 and is based at Marine Corps Base Camp Pendleton, California and falls under the command of Marine Aircraft Group 41 (MAG-41) and the 4th Marine Aircraft Wing (4th MAW). 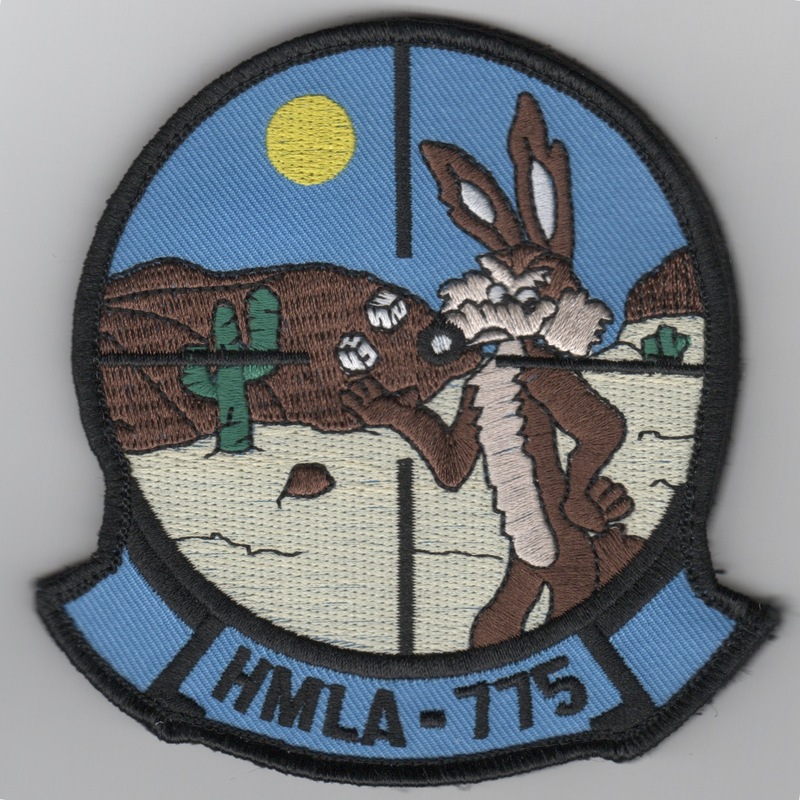 The 'Coyotes' of HMLA-775 participated in Desert Storm operating out of King Abdul Aziz air base, Saudi Arabia. 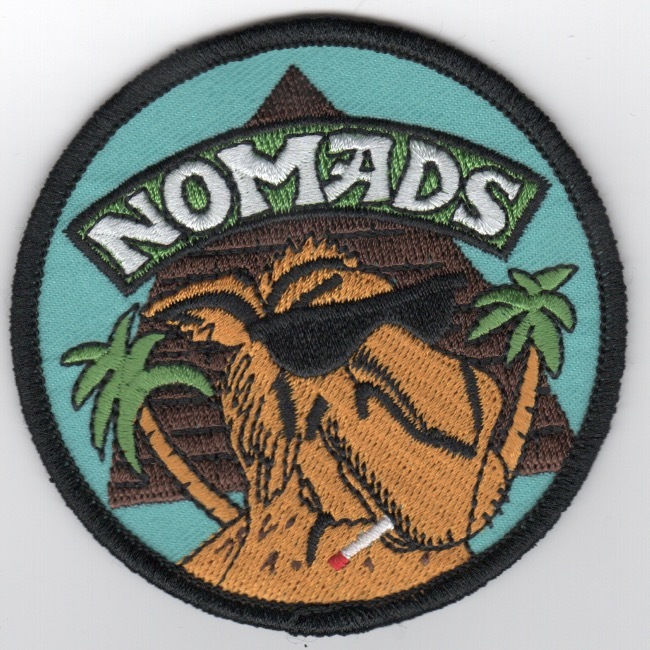 This patch is the "DESERT SKY" version of the squadron patch and already has the velcro on the back. 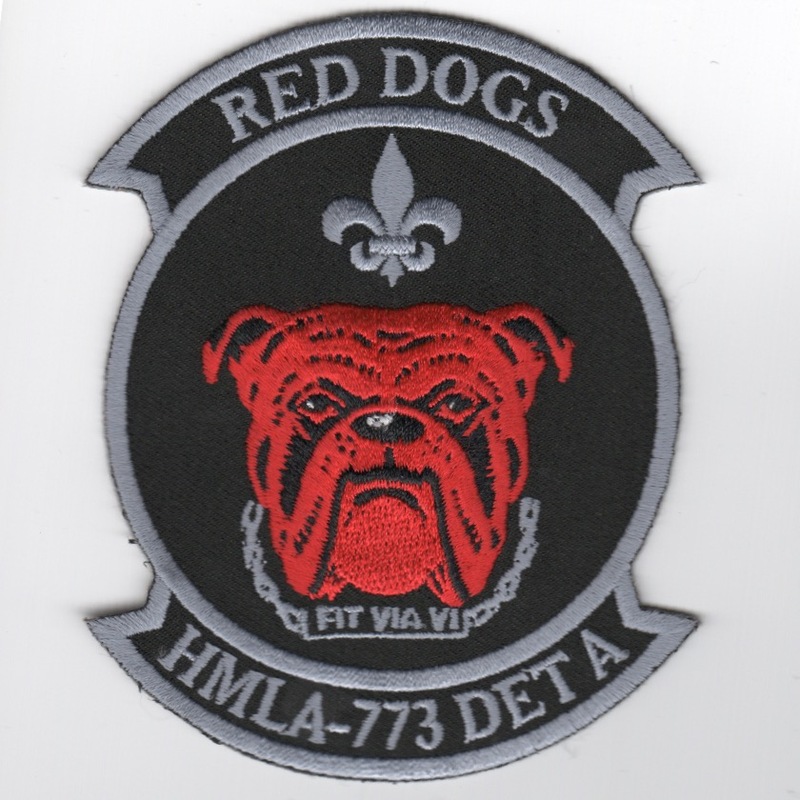 Use this link to get the set of three HMLA-775 squadron patches shown above at a 10% discount. An AV8RSTUFF creation: The 'Coyotes' of HMLA-775 are a Marine Air Reserve unit located at MCAS Camp Pendleton, CA and report to MAG-46 located at MCAS El Toro, CA. They participated in Desert Storm operating out of King Abdul Aziz air base, Saudi Arabia. This is the front view of their new squadron coin (the back side is shown below). An AV8RSTUFF creation: The 'Coyotes' of HMLA-775 are a Marine Air Reserve unit located at MCAS Camp Pendleton, CA and report to MAG-46 located at MCAS El Toro, CA. 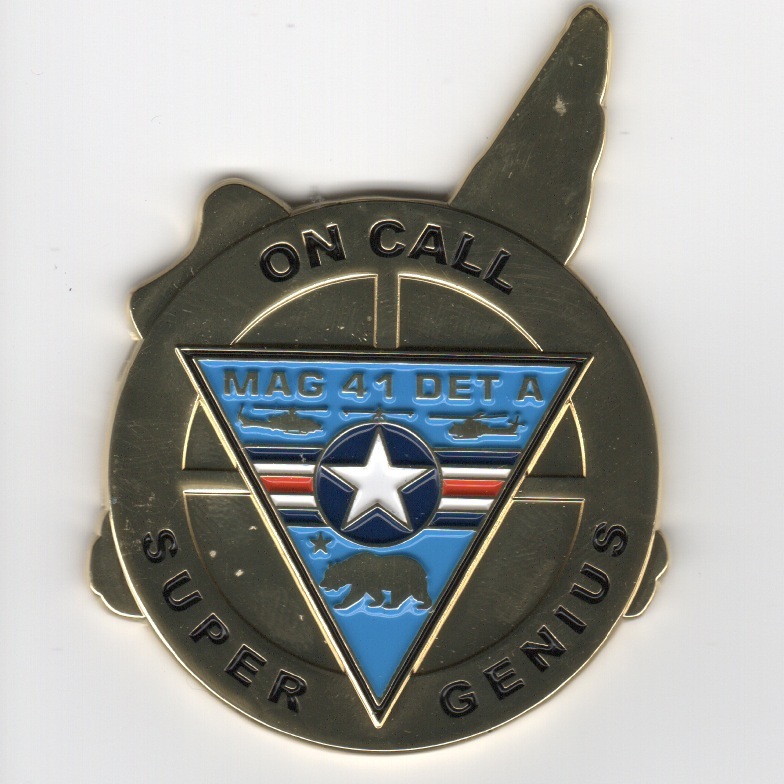 They participated in Desert Storm operating out of King Abdul Aziz air base, Saudi Arabia. This is the backside view of their new squadron coin (the front side is shown above). The 'Coyotes' of HMLA-775 are a Marine Air Reserve unit located at MCAS Camp Pendleton, CA and report to MAG-46 located at MCAS El Toro, CA. They participated in Desert Storm operating out of King Abdul Aziz air base, Saudi Arabia. This patch is the detachment version of the squadron patch for those deployed with det "A". Homepage | Order Helo Patches!